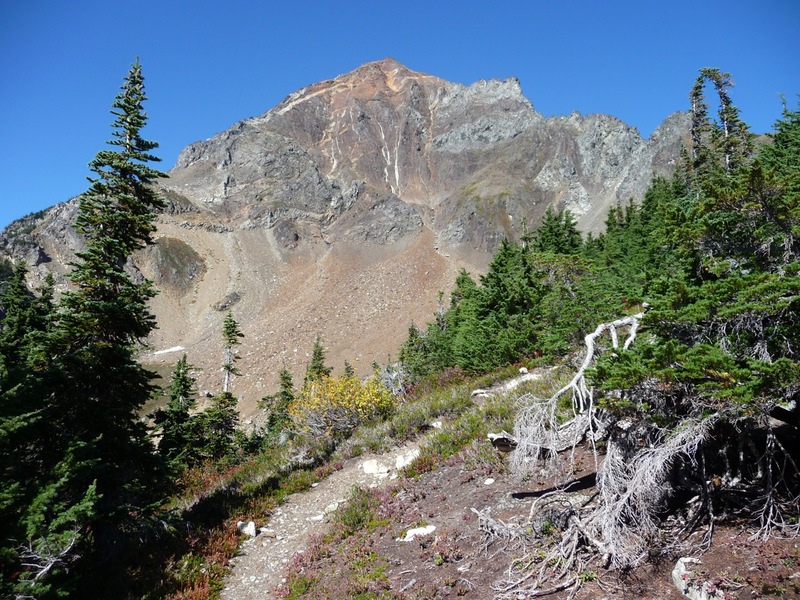 Yesterday I hiked out from Twin Lakes along the High Pass Trail with several goals in mind, among them visiting the site of the old Gargett Brothers Gold Mine on the side of Mount Larrabee. Twin Lakes Road is in excellent condition, the best I’ve ever seen. Of course it is still positively dreadful by any reasonable standards for judging roads, but a great improvement over past years. 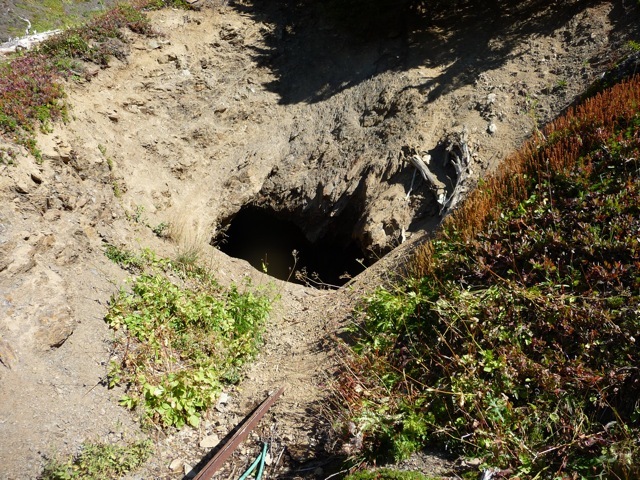 This may be attributable to the high price of gold – the owners of the Lone Jack Mine (the only active gold mine in the Mount Baker area) are responsible for maintaining the road, and I imagine that they are busy as little beavers this year. The trail branches to the right from the Winchester Lookout Trail about a quarter mile from the trailhead on the isthmus between the lakes. It is about two miles to High Pass, with a total elevation gain of about 1000 feet. The trail has been worked on recently and it is also in the best condition that I’ve seen. 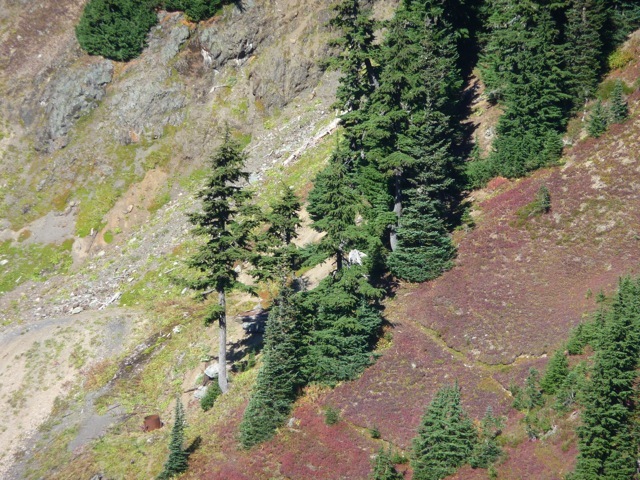 There are two trails continuing on from High Pass – the one on the right goes north up to a ridge on Mount Larrabee and the other heads northwest toward the mine, about a half mile further with a 200 foot drop in elevation. Here is a view of the mine area from High Pass. Note the rusty steel drum on the lower left and look up and to the right to the first good-sized tree. Just below the first branch on the right side of that tree is a rust-colored blob – a large flattened steel tank of some sort that lies right next to the adit. You can also see slanting up from the lower right the remnants of old mule trails that have been abandoned, replaced by very steep shortcuts. I did a little trail clearing, but you really have to keep your eyes open to find the old trails. 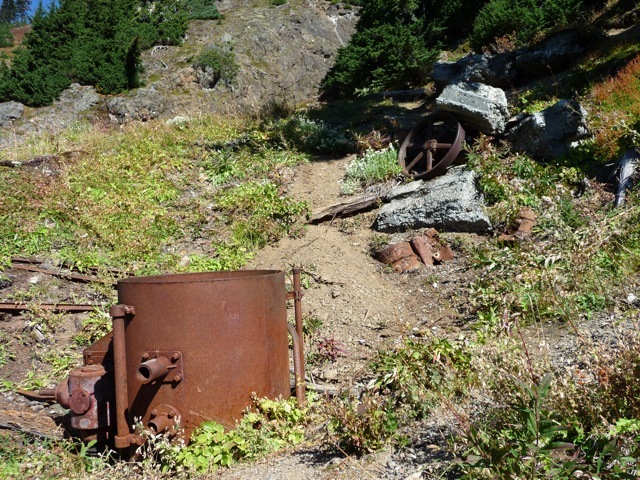 Here is a close view of that rusty drum-like thing and an old wheel, These are strewn on the ground about 30 feet downslope from the adit. If you miss the old mule trail, you will come to this point, whereupon you can either go back and look for the old trail or scramble straight up to the mine. Finally, here’s a picture of the adit. The opening is about two feet across. There is standing water in the mine and you can see some old timbers. I said finally but I lied – I just have to include a picture of Mount Larrabee, showing the light streaks that are dikes and sills of quartz where heavy metals are often found. I imagine that it was these streaks that inspired the miners to take on the Herculean struggle to reach this remote and challenging place.